For celebrity reviews, this is Andrew Zimmern's home turf. You can check out all Food TV reviews on mapmuse.com. Not that our RF Celebrity(Buddy) needs any help. Our other celebrity stop there was one of the suburban 5-8 Clubs. Not bad and I would definitely go back, but my friend who lived there a long time said Matt's Bar is better. Those were the two competing Jucy Lucy stops for Adam Richman. 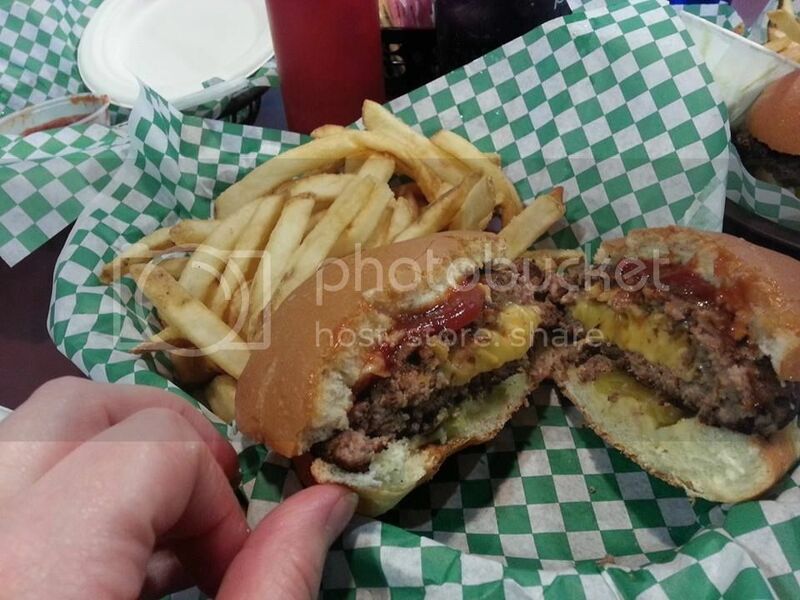 Although the Jucy Lucy, both traditional and "cutting edge", can be found in abundance in MSP, the three classics are Matt's Bar, 5-8 Club, and Casper & Runyon's Nook. Our favorite version came from 5-8 Club. However, the other two offer far more in the way of character and ambiance, with 5-8 looking more like a generic sports bar. My early inclination is to favor character since all three offer excellent renditions of the sandwich. I'm thinking we hit Matt's, The Nook, and one of the newer Jucy Lucy outposts. The Blue Door Pub comes highly recommended by MSP resident rumaki's husband, and seems to hit all the right notes for food and ambiance. 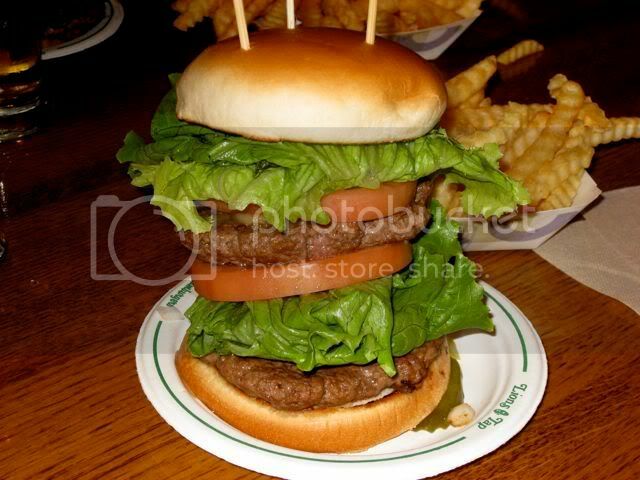 The Lion's Tap: The only Burger Joint I've ever visited where the actual food lived up to the menu pictures! Orioles are in town Friday-Sunday. Very good chance I end up at a ballgame that Friday night. I've been to the outside of Target Field and it looks awesome, although it was covered in snow at the time. I like how we had sort of a halftime on Friday night in Nashville and broke off to do our own thing. I'd be glad to coordinate tickets for anyone interested in going that route. Matt’s legendary bar burger nabs the number two spot. But it's the Nook that takes home the blue ribbon, both because he loved their no-frills, hella cheesy, thin-pattied Lucy and because he's enamored with the bar's bowling-and-skee-ball-vibe. I’m from the Twin Cities but maybe would have voted Cleveland if I had known. I will be in Cleveland the first week in May. I was just there two separate times this past month. There is nothing like the West End Market or Sokolowski’s in Minneapolis. I’m traveling the whole month of May and probably the last half of April (mostly Cleveland, Indianapolis and Washington, DC) so that will be out for me. In Minneapolis the Sons of Norway building will soon be demolished if it has not already. That’s the only time I had a Scandinavian “white dinner” during the holidays that consisted of lutefisk, cauliflower and potatoes. That was in 1980. You can put that idea to bed as far as I am concerned. It seems other parts of the country have false impressions about what Minnesotans eat as in grape salad no Minnesotan as ever heard of. Lutefisk is manufactured by the Olsen Fish Company http://www.olsenfish.com/ in Minneapolis but the product is most shipped overseas to Scandinavia and the rest is delivered over the border into Wisconsin for Lutheran church suppers. Tater Tots are a manufactured item out west and are pretty ubiquitous everywhere in my travels. Hot Dish is just a casserole but there is a revival of it in restaurants in hipster, millennial restaurants now that the movie, Fargo, has come to the attention the uniqueness of Minnesota with it’s German/Scandinavian heritage. Yes, German, as said before, more immigrants than any. But there is no German heritage in food, not even breaded pork tenderloin sandwiches (Schnitzel) despite Minnesota being the second leading pork producing state to Iowa. They do make the Spam but mostly export it. Go to Wisconsin for brats other than Kramarczuk’s Deli https://kramarczuks.com across the Mississippi River in Nordeast from downtown Minneapolis. Note that is not Scandinavian. The Nordeast neighborhood is mostly Eastern European as is the Iron Range in northern Minnesota. I think it is clear you have to go out of the Twin Cities to get anything resembling heritage Scandinavian food in Carole’s and Cafe Stugga. Heck you would be better off going to the the North Shore of Lake Superior. Now the Walleye. Yep, Minnesotan for sure, but you can get abundant Walleye in Lake Erie too and many restaurants near Cleveland serving the home caught thing. Most Walleye is a Canadian import as the only commercial fishery is the Red Lake Nation http://www.redlakewalleye.com/ You might be eating fake Walleye in low cost restaurants know as European Zander, https://sportsmansblog.com/2004/12/01/somethings_a_bi/ The best Walleye I had recently came from the Cov Restaurant in Wayzata, MN, https://www.covwayzata.com/ It beats Tavern on Grand hands down and you have a touch of Minnesota on the lakes, Lake Minnetonka. Juicy Lucy hamburgers. They are more popular now since the cable food networks overly featured them. Before it was just a niche rivalry between Matt’s Bar, 5-8 Club and the Nook. The Nook is the best of the three. The Blue Door Pub in St. Paul, http://www.thebdp.com/#blucy has their version, the Blucy that is rated a lot better. There are several restaurants that serve a better burger than the original three. That really leaves the wild rice soup as the unique food in Minnesota. That should not be missed. Heck, I would defer to Dale on where to go. Wild rice is still mostly harvested by Ojibway tribes. California now exports more so called wild rice now but it is farm grown and is not the Minnesota strain of wild rice other than dark long grain resembling it. If you want pure Minnesota, upscale, local sourced, Nordic and trendy there are a lot of restaurants but no other screams like The Bachelor Farmer in the downtown Minneapolis north warehouse loop. http://thebachelorfarmer.com/restaurant/ It was started by two sons of Governor Mark Dayton. Their mother was a Rockefeller. That’s pedigree. There are just so many others to mention. Millennials have a difference with this Roadfood group. The real action in town is craft beer. There are several neighborhood tap rooms that brew on premise. In fact there are more than 85 in the Twin Cities alone and growing. Some have restaurants but many being neighborly have delivery from local restaurants or food trucks. I’m a founding owner of Unmapped Brewing Co. in Minnetonka. The most prominent is Surly Brewing, https://surlybrewing.com/ as a can’t miss by out of towners near the University of Minnesota. They pretty much started the trend in Minnesota with the passing of the Surly Bill in the state legislature in 2011. The second oldest brewery in the United States is Schell’s in New Ulm (yep German again) and they own the Grain Belt brand, the most popular brand the farmers drank when I first moved to Minnesota in 1970. Hamm’s Beer is a bought brand brewed in Milwaukee now. They don’t count for diddle in Minnesota anymore. Al’s Breakfast is a dinky town (near the UofMN) and is an institution. It shouldn’t be missed. Mickey’s Diner has been the backdrop for several movies including A Prairie Home Companion, Robert Altman’s last directed movie. You get three birds with on stone in Garrison Kiellor’s demise from Public Radio, a movie back drop and a classic diner. I don’t think you can visit the Twin Cities without going to the Mall of America. Of course I say that. I put three years of my career as the architectural technical director for that project. Lots of not so memorable restaurants unless Bubba Gump’s Shrimp House or Wahlburgers are your preference. When I go, I stock up on Rybicki’s Cheese on the third floor west side, but they are out of Wisconsin. They have been in the Mall since it opened in 1992 and I have been a loyal customer. I’ve not mentioned new immigrant ethnic food. Yes there is a huge Somalia and Hmong population. In fact Minnesota may vote in the first Somalia female Muslim Congress person this November. That’s how significant it is in being able to carry a congressional district. My wife’s Scandinavian Norwegian cousin has moved to Sun City. AZ. I could go on and on, but that is enough grist for the mill for now. Thanks for your feedback. Your perspective as a resident is highly welcomed. It makes the job ahead both easier in some ways and more difficult in others. We share similar opinions on the Jucy Lucy front. At this point I'm inclined to include Matt's, The Nook, and Blue Door with Lion's Tap as a non JL addition. I've got multiple possibilities in the Walleye category, including Magnolias (recommended by both rumaki and ahi mpls) for a full sit down dinner, and Mac's Fish & Chips for a casual "on-the-fly" bite. Thanks for mentioning CoV Restaurant. Looks like a good possibility, albeit a bit pricey. Might even be a good Farewell Brunch spot for Sunday, although it's on the wrong side of town for most folks who are heading home immediately afterward. Tavern on Grand is still on the long list, but we'll need to see how many other places make the final cut. Kramarczuk's, of course, has an automatic spot in the itinerary. Its old world ambiance, combined with huge portions of excellent Polish food makes it the epitome of urban Roadfood dining. I'm hoping to hear good things along similar lines for old favorite Black Forest Inn, but so far, the reviews are mixed. Again, it might be a last minute add-on once we narrow down the list. Thanks for putting us onto Al & Alma’s Supper Club Cruises. I'll start looking into pricing for a group our size. Bachelor Farmer is already on the list. Again, it's a little on the high end, but might be a worthwhile splurge if we get positive feedback from the attendees. The area of difficulty comes into play with the craft beer scene. It's just not my thing, although I know at least half the group would appreciate at least one brewpub stop. So, if you're one of those folks who digs the suds, do the research and pick one or two of the places you think might have the most group appeal. If we can included them in the Crawl, great. If not, we'll work out some free time when the beerhounds can go off on their own for a frosty beverage. I think the Mall of America will be left for independent travel, both because of its location relative to the rest of the Crawl, and because, as you say, there's little memorable there in the way of Roadfood, or any food for that matter. I'm hoping you'll weigh in on the Somali and Hmong possibilities for good eats. I've got a couple of things already on my list, but am always looking for better options. Overall, we're thinking along the same lines. I don't want to exclude any of the Twin Cities' heritage foods, but don't want to focus exclusively on them either. A good mix of old and new, familiar and exotic will make this a Crawl to remember! FWIW, I noticed that the Blue Door Pub has opened a branch at MSP when I was at the airport late last week. Of course, you know that airport branches can be iffy (for example, the branch of Smack Shack at MSP is very uneven, at best, though the MSP branch of Black Sheep pizza is quite good). The Blue Door just opened at the end of August. Unfortunately, I’ve just been told by my management that I can’t have the week of April 22nd off. Too many members had already requested it, so I won’t be able to attend the Crawl this year. Can you send in a video tape? It's tough being the new guy. Too bad you have no seniority. Who's going to play the cello solo in the Jucy Lucy Cantata if you're not there? I was actually counting on being able to use a seniority leave but someone else in the cello section had already requested seniority leave for that week and only one person in each section is allowed per week (maximum five for the whole orchestra). And I was so hoping it would be me. I understand there’s a really good tambourine arrangement. Maybe the ChiTownDiner can take my place. Looking forward to a return trip. There's always Cleveland in May. Wasn't Cleveland in May a Mickey Rooney/Judy Garland musical? Wasn't David Sanders in the orchestra for the film? It was the only one where the kids couldn't overcome adversity, the show didn't go on, and the greedy bankers foreclosed on the farm. Then everyone moved to Cleveland. in May. Hence the title. No, in the 1940s I had been in the CSO 26 years already. I’m now in my 71st year. Actually, there was a woman bass player who started in the newly formed Atlanta youth symphony at 16, which was then opened up to adults and two years later became the Atlanta Symphony. She played with them for 71 years, collapsed on stage during a performance of “There’s No Business Like Show Business” and died later that day. Can already say now that while I can't wait for this trip, we'll be getting the eff out first thing Sunday morning so we won't be able to join any festivities that day. Thirteen hour drive after the time change. Is there a final decision on Date? or are there several possibilities? Using the 1 through 5 ranking system, the group chose April 25th-28th as the priority date. I've been to MSP in late April, and the weather was fine; cool and dry. Barring a freak blizzard it should be quite pleasant. Au contraire. That privilege belongs to BooBooBears15. I think you mean 3and1FirstPlace(Seriously,aTieWithMinnesota)Bears15. But yeah, he started the thread; only he can edit the title. Whaddaya say ScreamingBear? Are you out there? Can we add the dates to the title, or what? Well done Boo Boo. That was way beyond the abilities of ChiTownPieH8ter. I am shocked at this slanderous behavior! After all, we're all sharing a 1 bedroom AirBnB in MSP! I thought I was in charge of the accommodations?